About the Band: Ritter's songs are generally lyrically dense and rife with historical references. He's been releasing albums for over a decade now, none better than 2006's The Animal Years. 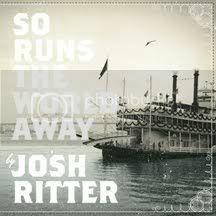 Last Record: 2007's Historical Conquests of Josh Ritter certainly had its moments, but wasn't quite up to par with its excellent predecessor. Reason for Excitement: I'm no Ritter fanatic (these people exist and they often frighten me) but the guy can write a song. "Good Man" from Animal Years is one of the best songs of the last decade. Reason for Concern: Josh's songs are very lyrically dense; sort of like Dylan, but with Josh it's less about stream of consciousness and more about storytelling. So it can be mentally fatiguing to try and keep pace with the action. Early Indications: "Change of Time" and "Rattling Locks" were made available early on, and they're not bad. Prediction: Since The Animal Years is the only album of Ritter's that I'll staunchly defend, it's not particularly set up for success in my mind. But it could be some nice relief from the dense indie rock melee that awaits on virtually all other fronts.